A customer contacted us this week who had been using a competing Android Outlook Sync product. A Windows Update caused the sync to fail with a Windows Sockets error. We recommended CompanionLink for Outlook, which can synchronize directly from Outlook to Android using a USB Cable. There are a number of Outlook Android sync products, but only a few companies will handle it like old Palm Hotsync from PC to Phone using a USB cable. The customer was in a hurry, having already spent hours on the problem. So we recommended our RunStart service. With this service a technician logs into the computer to set up the software. The sync needs to match up the Contacts and Calendar items that are already on the phone, so it is helpful for an experienced technician to watch for any problems with duplicate data. It is not uncommon to see duplicate data when switching from one sync product to another. The reason is that your data is already on both sides of the sync. So if there is any formatting changes, a computer product may not recognize similar contact and calendar data. CompanionLink 8 contains a dedupe utility that can quickly clear duplicates from Outlook and your Phone. There is no extra charge for this function. CompanionLink offers a competitive upgrade for anyone who has purchased a product from one of our competitors. You can purchase the “Upgrade” price, even if you are buying from CompanionLink for the first time. Here is a link for a Competitive Upgrade to CompanionLink for Outlook. Here is a link with added RunStart service, and an additional $10 off your purchase – total $78.95. With this service, you will be on a fresh new solution in just a few minutes, and ready to carry on your normal day’s business. 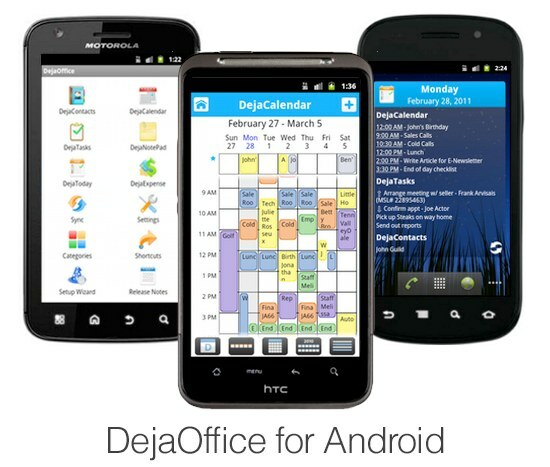 CompanionLink is proud to announce DejaOffice for Android, a mobile office application suite for Android-powered devices. DejaOffice contains robust contacts, calendar, tasks and notes apps that allow users to efficiently view, enter, update and manage contact and schedule information from their phone. Advanced features such as categories, custom fields, search across all data types, sort options, expense tracking, and linking of contacts to calendar items are included in the app. DejaOffice augments the Android contacts and calendar databases with enhanced functionality, and also offers robust tasks and notes apps originally missing from the Android platform. Many business professionals are upgrading to the latest smartphones only to find that they are becoming increasingly consumer-oriented, and lack required business functionality. Many users, especially those coming from old Palm phones like the Treo or Centro, are dismayed when they upgrade to a newer platform and lose features and functions. DejaOffice is a solution to fill that gap, and bring Android devices more in line with how PC business software works. DejaOffice works seamlessly with CompanionLink’s PC desktop synchronization and backup software. This allows two-way sync with applications such as Microsoft Outlook, Lotus Notes, GoldMine, GroupWise, ACT! by Sage and Palm Desktop. The DejaOffice app is currently available at no charge from the Android Market. More information is available at www.dejaoffice.com.